HA NOI (VNS)— Coach Toshyia Miura has called 27 players to train for two matches during the 2018 World Cup qualifier. Viet Nam will host Iraq on October 8 and Thailand five days later at the Ha Noi's My Dinh Stadium. Miura yesterday gathered four goalkeepers, nine defenders, nine midfielders and five strikers who will start practicing tomorrow. V. League 1's Ha Noi contributes the most with six players who are present in all positions of the team. 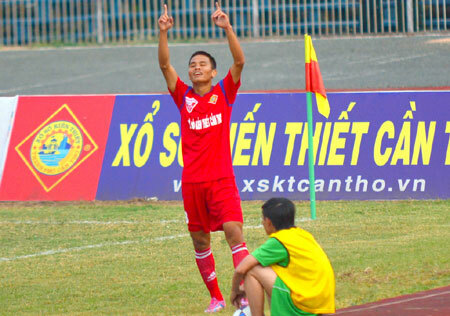 Song Lam Nghe An and champions Becamex Binh Duong have four each. Senior striker Dang Khanh Lam of Hai Phong still wins Miura's trust as he continues to be a part of the team despite being 33 years old. Local best striker Le Van Thang of Can Tho, who scored 16 goals this season, has been called for the first time under Miura's tenure. Keeper To Vinh Loi who became unemployed one round before the end of the V. League 1 is also named in the list. The team will have 10 days training to prepare ahead of their matches. Iraq has been considered the strongest team of the Group F.
However, after an accidental 2-2 draw with Thailand earlier this month it is in second place with four points. Thailand with seven points has the best chance to advance to the next qualification. Viet Nam is in third place with three points after a win over Chinese Taipei on September 8. In the first leg match in May, Thailand defeated Viet Nam 1-0. Earlier this week, their coach, Kiatisak Senamueng also announced a list of 23 players to face Viet Nam in the second-leg game. The Thai named three goalies, eight defenders, nine midfielders and three strikers. Among them, Chanathip Songkrasin, who is known as the Thai ‘Messi', is back in action after his injury break. The striker has a skilful technique, good speed and an accurate finish. Adisak Kraisom, Mongkol Tossakrai, Tanaboon Kesarat, and Teerasil Dangda are also players to watch out for any team of the group. They will start training on Monday before a friendly match against Hong Kong on October 8 in Bangkok.